Car hauler from an unknown toy producer. I've added this to the site, in the hope that one day more information on this unusual plastic toy lorry will turn up. There are no factory markings on either the racing cars, or the articulated truck unit, so for now the maker of this transporter and cars will remain a mystery. The rig measures fourteen inches long overall, with each of the three cars being approximately 3.5 inches in length. 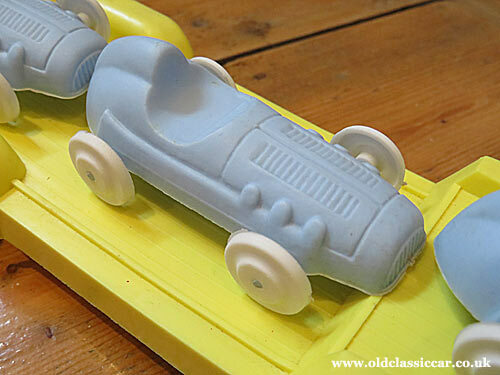 Without identifying the manufacturer of this toy, it's tricky to put a date on it. The style of vehicles is very much of the 1950s, so I'd estimate that it was made in the late 1950s or early/mid 1960s. Each car sports a dual exhaust setup, pointing to a V6 engine being fitted :-) The fact that they're front-engined Grand Prix cars suggests that the mouldings were based loosely on cars of the early/mid 1950s, rather than those of a later era. 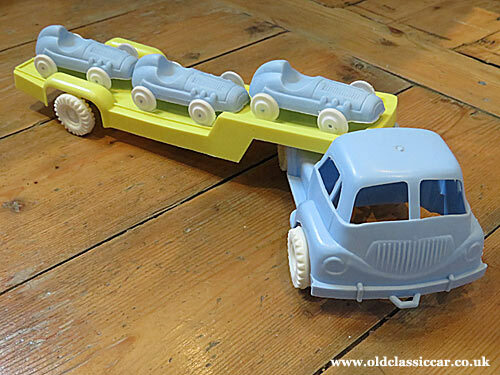 The toys are simple plastic moulded affairs, the truck has steel axles and plastic wheels, while the wheels of the cars are press fits onto the body moulding, and as a result don't turn.